Originally I wanted to title this post, “When Sales and SEO Don’t Communicate” but realized it was more about an all too common marketing failure – not ensuring Searcher’s can accomplish what they came to the site to do. Many companies fail to grasp the fairly simple concept of connecting keyword phrases they want to rank for to why a searcher uses them in the first place. Even more importantly, task completion – when the searcher gets to the page, can they do what they expected they could? In the article below it was fairly simple what I wanted to do but not asking that simple question, ensuring I could complete the task they lost a customer. How many customers are you loosing since you did not connect the dots? My wife loves her point and shoot Panasonic camera. It is compact, super zoom and takes great pictures. Unfortunately, looking at our Cuba pictures she found dust had somehow gotten on the sensor and she had dark spots on all of her photos. I assume many would just buy a new camera and call it a day. Since I send in my pro-level camera every other year for cleaning and tuning I assumed that might be possible for hers. 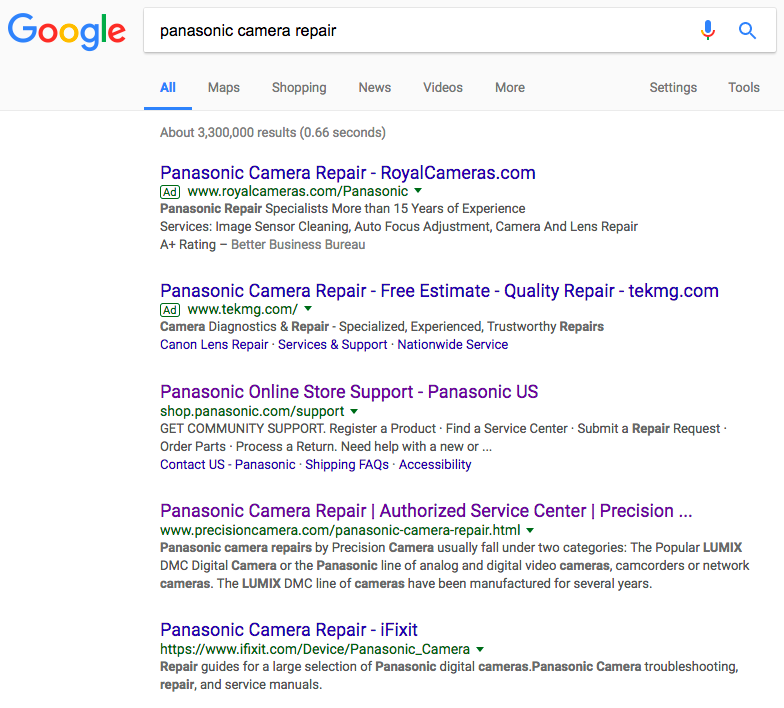 So I did what most would do – I did a Google search for “Panasonic Camera Repair” to see if there was a repair center near me. Here is what came up. Skipping over the paid results, the Panasonic Support site comes up first so I go in and try to find where and the estimate to get it services on the Panasonic site and had a horrible experience, which will be my next article on how poor service can hurt an already damaged brand. For the purpose of this article, lets focus on the 2nd organic listing for Precision Camera. A few things catch my attention, first, the exact match title in the search result and of course the exact match URL. The snippet is not great but I am sucked in by the title and that they are an authorized service center. Going into the page, I see more SEO handiwork. 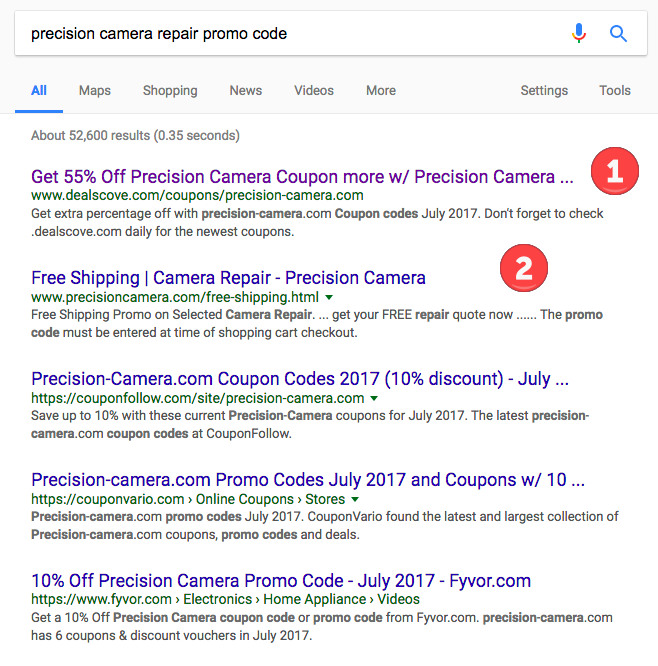 Everything is about Panasonic camera repair, heading, images, multiple references in the page so the SEO has done a great job of actually over optimizing this page but it is ranking #2 after the brand so we will take it. Given all these signals I am clearly on a page that can help. Since they have repaired 4 million cameras – that is another good sign. So I start the process to make sure they can repair my model and maybe get some idea of the cost to do it. I click the pull down to select my make, which by now you know is Panasonic and it is not there. Come on now…How can a page that ranks #2 in Google and be expertly tuned to Panasonic camera not have Panasonic on the pull down? This company too k the time, effort, and cost to create a page and optimize the page for a very specific make of camera yet did not list it on the page. One could argue that it should default to Panasonic so the user would just pick the model number but at the very least ensure you have it listed on the page you have optimized for it. In most cases when I have encountered this type of disconnect it is due to the sales and marketing side not talking to the SEO. Most companies will give a list of words they want to rank for to and SEO or agency and not have any consideration for what people do when they get to the page. Unfortunately, many SEO’s will blindly do a great job of optimizing the page to meet the clients demands but themselves not connect the dots. This goes back to the currently popular discussion on Searcher Intent which is a whole other rant in itself. 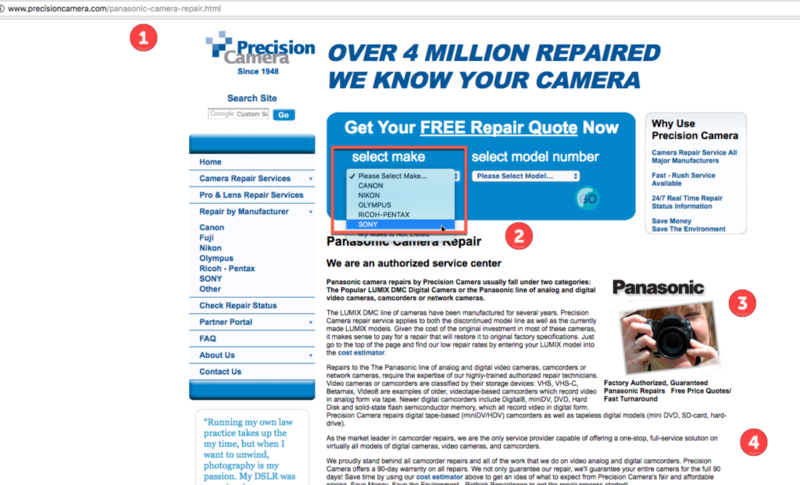 But what did you expect a person searching for “Panasonic Camera Repair” to do once they got to the page? Did anyone check to see that they could actually do it? Do you even support the brand? Ok, so there is the option to choose “My make is not listed” and since mine is not listed, I clicked it. It pulls up a form. The form is the standard contact us form form and does not even ask me my model and some things that are not relevant. Company – why is my company necessary? Do you get a lot of company requests? Serial number – maybe you can find the make/model from the serial number but would it not be easier to just ask me the make and model of the camera and the serial number to idiot proof it? The comments – maybe suggest I tell you what is wrong with the camera? I would be curious how many people just backed out of the page never communicating with them? There is at least one, me, as it was not worth the effort to try and contact them. They are using Google Analytics so a simple test would be how many people clicked the missing model and yes, if I find a pattern for a model I might add it to the pull down. So I wondered… what happens if choose Canon and then a model on the list? 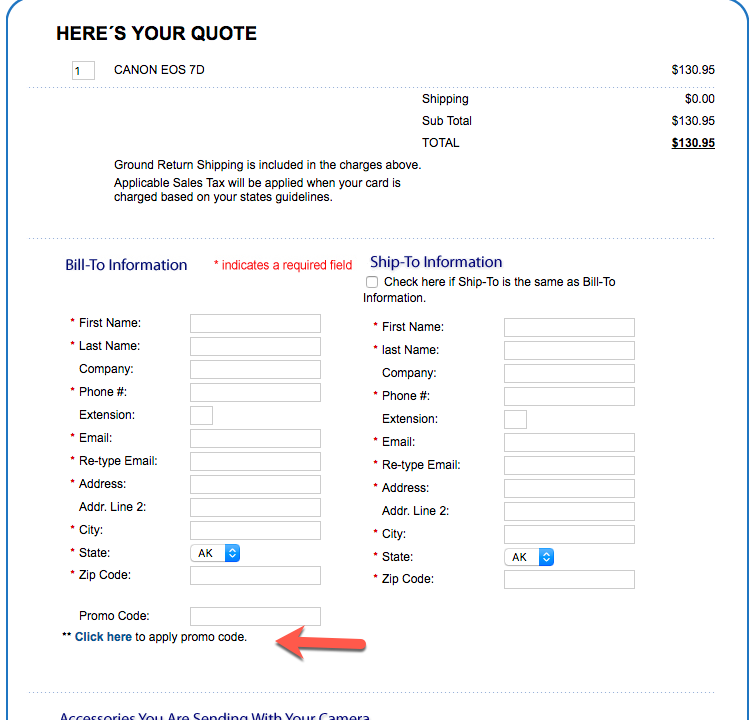 I get a quote form telling me they they will apparently do something to my camera for $130.95. Of course I have questions with this page. I did check and they rank #4 for “Canon Camera Repair” so that is great but we have the new experience detailed below. What do I get for this service? I could not find anything on the site, even in the FAQ area that indicates what will be done to my camera for $130. No where on the site did it tell me what is to be done. There is a link to the service estimation tool but that is the page I selected for the camera make and model. So, is the $130 the estimate to do the estimate? My favorite is the promo code box so of course, I searched for a promo code. What I found was a bunch of promos for a similar named retail camera store in Austin Texas and one listing for this Precision Camera. Since I knew the domain I clicked on the correct site and this opened up another basket of goodies. The offer is for inbound shipping only – do you discount the offer based on what the postage on my box has? What if I send overnight? As I tell people, if you use the box then you should have a code. Either remove the box from the form when you don’t have them or have a page like those mentioned in the article above. You can also use it to capture social media follow/likes or an email address by offering some incentive to give your contact info. In the end, not being able to get service easily, and seeing that most service centers charge $150 to clean a sensor, I found a YouTube video that walked me through the process. It was relatively painless process showing step by step how to take the camera apart and cleaning the sensor which I did in about 30 minutes. I apologize for outing this company for these missteps but if it helps them or another company to make these changes that is great. This was more a stream of conscious article than one well researches. For the haters, this will clearly be a “do as I say not as I do” article as I assume that some will go to my sites and rip them up. I welcome that as I already have a list of 217 items I need to change and if you can find more they will be added to the list. As I am sure with most sites, I am focused on client deliverables and don’t have time to get to them. So what should this experience have been like – I was expecting something like Canon’s support process. 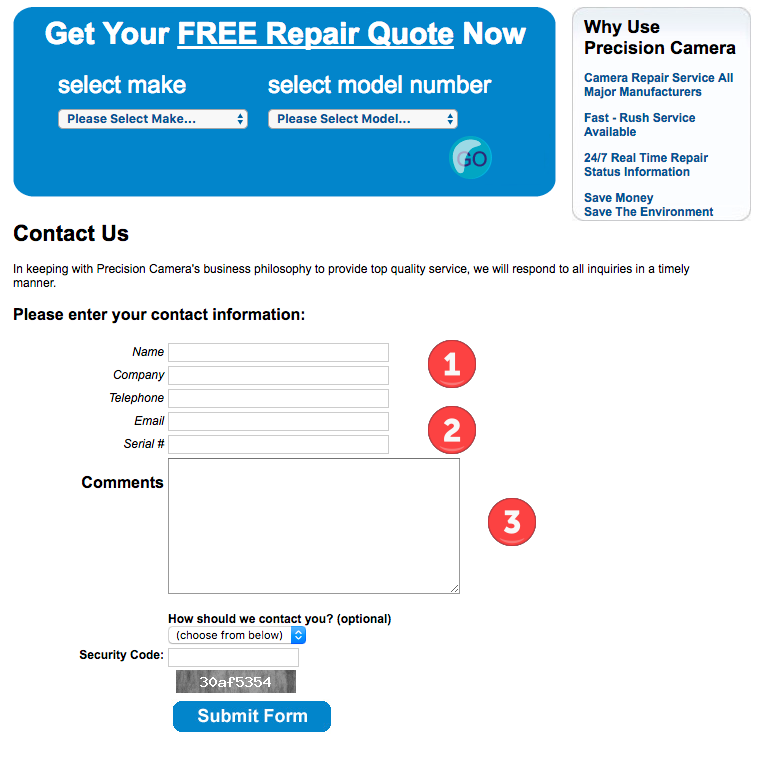 They are ranking #1 for Canon Camera Repair with a couple of site link and I click the one for “Repair Request.” The form starts out telling me to type my Model – to be fair, this is Canon, and they only service Canon. This then brings up a page that lets me choose what I want done to the camera. If I don’t know I choose the first repair option. Since it could be many things they need to see the camera to determine the problem and then give me a quite. The other two options are a sensor cleaning, which is what I needed for Motoko’s camera or to get a full cleaning and tune up. This is what I typically have them do. I don’t have to guess what is going to be done. I don’t have to pay $130 to just have the sensor checked if there is a one price fits most option. This allows the searcher to be informed and make the decision that is best for them. I would suspect the effort to box the camera and send it it might as well go with the full service since they have it. Again, if you simply think about why the searcher did the query, when they come to the page what do THEY want to do and what do you want them to do next you can move people through a more informed process and increase conversions. Just to fully disclose, I don’t work with Canon or Precision Camera and had no reason to write this other than to help business do a better job of leveraging their high ranking pages. I have a Canon Camera and have used their repair service for a couple of cameras in the past and it was totally painless and am a total Canon fan boy. –Edit– Damn… people are quick…. I just had someone ping me mention that Rand Fiskin had recently introduced this ground breaking concept as a critical ranking factor on last weeks White Board Friday . I love that post and it helps solidify that this is a problem that needs to be solved. And no, I did not rip off Rand, Mike Moran and I actually dedicated nearly a whole chapter to this topic in all three editions of Search Engine Marketing Inc. The first edition went to print in 2004 and Chapter 4 goes into great detail about how searcher’s search, Searcher Intent and specifically Searcher Task Completion – how to move them to conversion based on the query, query intent, and phase of the buy cycle. In the current Edition of Search Engine Marketing Inc, in Chapter 2 we go deeper into this process but also introduce location and device into the equation as they also have significant impact on the completion.